New Zealand stunned world number 15 and fellow FIFA World Cup finalist Serbia with a deserved 1-0 victory in Klagenfurt, Austria today. Shane Smeltz scores the only goal to give victory to the All Whites. Shane Smeltz struck the game's only goal in the 22nd minute, cutting inside Antonia Rukavina before tucking a shot inside Vladimir Stojkovic's near post after Rory Fallon had headed Winston Reid's long pass into the path of his fellow striker. 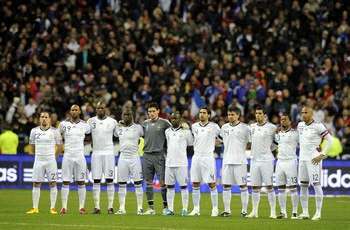 Ranked 63 places above the All Whites, Serbia are the All Whites biggest scalp since FIFA started publishing its rankings 18 years ago, but with the FIFA World Cup the main focus, New Zealand coach Ricki Herbert was not allowing the team to get ahead of itself. "It's always been about performance for us, but a win like this over a top class nation like Serbia is a great bonus. The victory, just New Zealand's second on European soil, is a timely fillip given the All Whites face two European nations – Slovakia and World champions Italy – in Group F.
It also gave Herbert some food for thought selection wise, with players staking their claims for a World Cup starting spot. "We made four changes and I thought Tommy Smith and Winston Reid, who only have three caps between them, did extremely well at the back alongside the captain. Jeremy Christie came into midfield and did well and Chris Wood in his first start against a big team was outstanding." Two minutes after the opening goal, New Zealand almost found a second following some free-flowing build up but Stojkovic managed to beat away Fallon's shot and Smeltz's follow-up was somehow deflected to safety. Serbia too had their chances, and Neven Subotic could have easily levelled the scores with a back post header in the 39th minute, while a pair of Mark Paston saves midway through the second half kept a deserved clean sheet intact. Paston was called in to action again in the 73rd minute as to swat away a shot that deflected of Nelsen but substitute Jeremy Brockie almost put the game beyond doubt late in the game when he stole in between Vidic and Subotic and laced his shot into the side netting. The match was marred by crowd disruption, with objects thrown onto the pitch and a handful of Serbian fans ghosting past pitch side security. Serbia's captain Vidic did his part to calm the guilty section of the crowd down allowing the Austrian referee to restart play and see out the final few minutes. Goal hero Smeltz, said the team had the belief that they could get a result against top teams and that the focus remained on their World Cup opener against Slovakia on June 15. "It's great to get a win over a nation like Serbia who some are saying are dark horses for the World Cup. "We'll take some confidence from it obviously, but we won't be getting carried away." Upon their return to St Lambrecht, the All Whites were greeted by a civic reception at their hotel where traditional Austrian folk dancers and bands welcomed the team. Tomorrow the All Whites travel to Bad Waltersdorf, where they will be based ahead of Friday's friendly with Slovenia. Many of the squad will take time out en route in Graz to watch England take on Japan. New Zealand: 1-Mark PASTON (GK), 3-Tony LOCHHEAD, 4-Winston REID, 6-Ryan NELSEN (captain), 7 Simon ELLIOTT, 9-Shane SMELTZ, 11-Leo BERTOS, 14-Rory FALLON, 19-Tommy SMITH, 20-Chris WOOD (22-Jeremy BROCKIE 61), 21-Jeremy CHRISTIE. Serbia: 1-Vladimir STOJKOVIC (GK /23-Andjelko DJURICIC 46), 2-Antonio RUKAVINA, 5-Nemanja VIDIC (Captain), 20-Neven SUBOTIC, 16-Ivan OBRADOVIC (3-Aleksandar KOLAROV 21), 22-Zdravko KUZMANOVIC (21-Dragan MRDJA 59), 11-Nenad MILIJAS (4-Gojko KACAR 46), 7-Zoran TOSIC, 18-Milos NINKOVIC, 15-Nikola ZIGIC, 9-Marko PANTELIC (8-Danko LAZOVIC 66). Substitutes not used: 10-Dejan STANKOVIC, 12-Zeljko BRKIC (RGK), 13-Aleksandar LUKOVIC, 14-Milan JOVANOVIC, 17-Milos KRASIC, 19-Radosav PETROVIC, 24-Bojan ISAILOVIC (RGK). 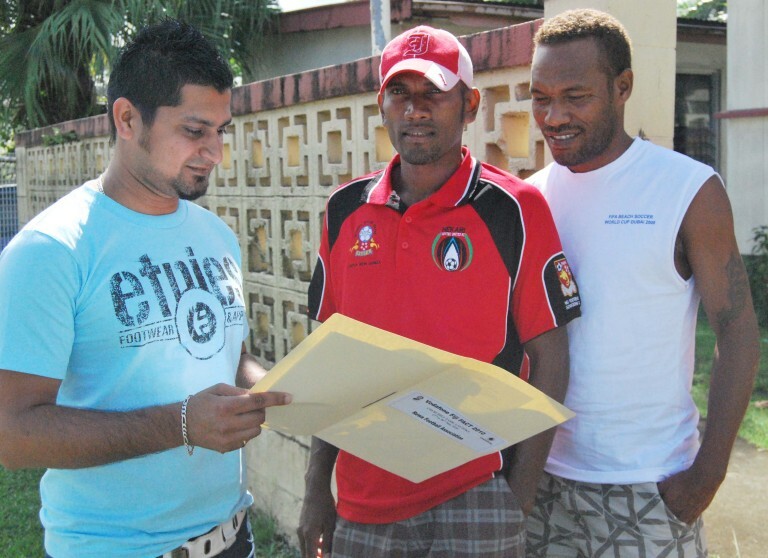 Fiji FA CEO Mr. Bob Kumar revealed that three more players have been granted their International Transfer Certificates. 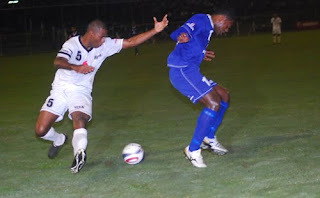 Solomon Islanders Abraham Iniga (Marist FC) and George Lui (Makuru) are the latest players cleared for Rewa while Brazilian native and US based Bay Area Ambassadors player Pedro Osorio for Navua. "I can confirm that Abraham Iniga and George Lui have been granted their ITC (International Transfer Certificate) and are free to play for Rewa. Pedro Osorio of Bay Area Ambassadors has also been cleared for Navua," Kumar said. The 2010 Vodafone Fiji FACT starts tomorrow afternoon at Churchill Park in Lautoka. The trio joins the line up of other international talent with the likes of Navua- Stefan Clemens (US): Nadroga- A A Akande , O Saheed A (Nigeria): Lautoka- Danny Robinson (Waitakere), Salesh Kumar, Jurteet Singh Nijjar (NZ): Ba- Tuimasi Manuca (Hekari): Labasa – Roy Krishna (Waitakere), Pita Bolaitoga (Hekari United). On the other hand Mr. Kumar confirmed that Vodafone Chief Operating Officer Mr. Pradeep Lal will officially open the 2010 Vodafone Fiji FACT. Mr. Kumar says everything is on track and that they were ready for the first major tournament of the year. The match will be remembered as the coming of age of many young players from both teams as they rose to take over the mantle from some of the former big names. The stars of the match were Koloale's Ian Paia, Francis Lafai, Steve Saru and Marist's Tutizama Tanito, Ben Hibiscus and Michael Oiramo. Marist went ahead after just 1 minute after winning a penalty. Michael Misitana took the first shot but it was blocked by the Marist goalkeeper. Fortunately, Bentley Nalangu was there to make sure they got the worth of the penalty. In front and in control Marist were looking like the much better side. Koloale were late to overcome their nerves but managed to mount promising attacks on Marist after they settled down. Marist looked like they were going to extend their lead but fortunately for Koloale they were able to prevent further goals from their opponents. Shadrack Ramoni has never been busier in the tournament and this match certainly brought out the best in him. As half time arrived the score line was at 1 - 0 in favour of Marist. Koloale returned in the second half determined to wrestle the game away from their opponents and made the best restart they could have hoped for when Henry Fa'arodo followed up a shot from Paia to kick it into the back of the net after Navusu Kitu failed to fully catch the ball. Three (3) minutes later Paia got himself on the scoreboard. His jump for Lency Saeni's cross was higher and better timed than the others that competed for the ball and his header was even better. By now Koloale were back in control and maintained their 2 - 1 advantage while they searched for extra goal buffer. Marist suffered a set back in the 61st minute when left defender Sam Bino was red carded after being cautioned twice in the match. Koloale, however, failed to make use of their 1 man advantage until the 81st minute when Benjamin Totori scored their third goal. His goal can be considered as one of the best in the championship after brilliant dribbling saw him beat 3 Marist defenders to score from inside the 18 yard box. The full time score of 3 - 1 was enough to take Koloale through to the semi finals where they will meet the winner of the match between KOSSA and Northern United. The French Government has added its support to Tahiti's hosting of the 2013 FIFA Beach Soccer World Cup. 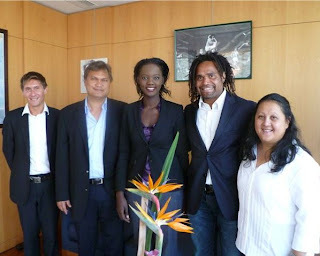 OFC President Reynald Temarii lead a delegation - including Tahiti 2013 chief executive Noelline Parker, OFC head of social responsibility Franck Castillo and FIFA ambassador for Oceania Christian Karembeu – to Paris this month to meet with the French ministry of sport. President Temarii sat down with Rama Yade, the French secretary of state for sports, to discuss funding for the event and the possibility of further cooperation between OFC and France in regards to other programmes. Ms Yade pledged her support for the tournament and another meeting will be held in the same city during September to confirm the financial details. President Temarii has also invited Ms Yade to participate in the OFC Congress, to be held in Tahiti on January 21 and 22 next year. She has accepted the invitation but her presence will depend on how busy her schedule is at the time. Tahiti won the right to host the beach soccer world cup in March in what was a big coup for the French Polynesian federation. They beat off competition from world-class bidders Argentina, Brazil, South Africa, the Netherlands, Azerbaijan, Poland and Oman and will become the first Pacific nation to host a beach world cup. More than 600 players, staff and spectators are expected to come to Tahiti for the tournament and it is likely to inject a significant boost into the country's economy. It will also expose Tahiti as an international holiday destination as the games will be broadcast on television in 147 nations. "FIFA's executive committee has just given French Polynesia one of the best sports events of the world," President Temarii said when Tahiti was confirmed as the winning bid. After leaving Paris, the president and his delegation also stopped off at the headquarters of the European Commission in Brussels, Belgium. They meet up with Luis Riera Figueras, who is in charge of the commission's relationship with the African, Carribbean and Pacific countries, and Ranieri Sabatucci, director of the Pacific division. The meeting was centred towards the OFC development projects but other issues – such as global warming, a subject close to the heart of President Temarii – were also discussed. 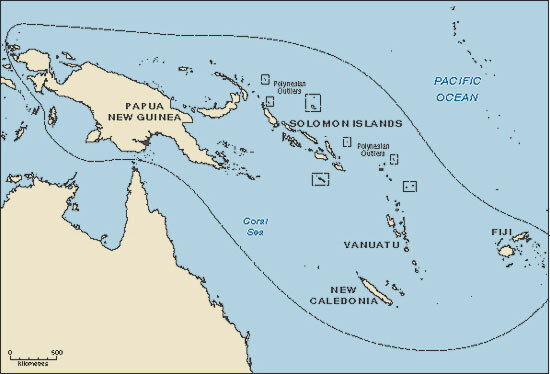 President Temarii is concerned over the plight of Tuvalu, a small Pacific Island nation midway between Hawaii and Australia. The country's series of islands and atolls are only 4.5 metres above sea level at their highest and officials have been concerned about the effects of rising sea levels for some years. 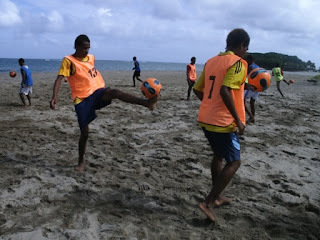 Other low-lying Pacific nations may also soon be under threat and President Temarii is keen to raise awareness about this problem by hosting international beach soccer games. Another highlight of the trip was meeting Thierry Catteau, a young Pacific Islander who is working for the European Commission. President Temarii says Catteau's achievements are an inspiration and provide something for all young people in the Oceania region to aspire to. "To discover a young Polynesian working in such an important institution and having a key role is enough to say the day was a real success," he says. 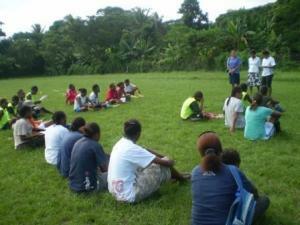 "It shows that the new Pacific generation has real potential to build the region for tomorrow." 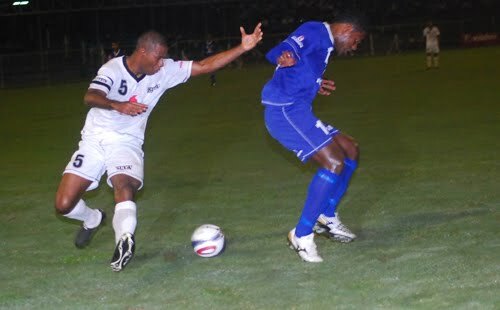 2010 Vodafone Fiji FACT hosts, Lautoka had to fight tooth and nail to beat a spirited Suva outfit 1-0 but Suva coach Dennis Singh says his team will fight till the end with two games at the tournament remaining. "It is just disappointing, the loss but we have put that behind us now and are focused on winning the two remaining games and just wait what happens from there on," said Singh after their close shave loss. He admitted many may have already written Suva out after two losses in the competition so far but said his team will fight till the death. "Its not over until its over, we have two more games remaining and that to us is an incentive to better ourselves as a team,"
He said it was difficult when the players do something different from what they are told. Meanwhile Lautoka coach Imdad Ali said he was happy with the win adding that his team can only build to be a bigger better team in the coming days of the tournament. "There are a few things that we need to iron out to perfect our game and i am confident and i have faith in this team to better in the next two days of the competition," he said. Ali was full of praise for his goal scorer Samuela Kautoga saying he is a hard worker and deserved to score to establish his stalwart figure in the team. Lautoka playing from the Natabua end of the Sugar City kick starts the first half of much anticipated final match of day three of the 2010 Vodafone Fiji FACT on a cool Thursday evening at Churchill Park. Our referee for the game is Ravitesh Behari takes control of the match. 10th Min Update: Lautoka starts the game from the Natabua end of the park and has been hot on attack with the backing of the home crowd behind them. The game see-saws as both sides change hands in possesion and after a few exchanges the host go straight into attack keeping the Suva defence on its toes as waves of attack led by Valerio Nawatu and Osea Vakatalesau see the whites rushing back to defend their goal. But Suva has come to play also, Dennis Singh has definitely drilled his team well on how to netralise Lautoka and play them inn their own game. So far it has been working and the Blues seem to have to retreat fast guard their goal as Lisala Veutaukula Cedrick Datt and Shamil Rao have also been asking serioud questions in their defensive game. 25th Min Update: Osea Vakatalesau misses a sure goal after he beat the scrambling Suva defence and raced away with only Mesake Navitikula and an open goal to beat. But Navitikula is fast and reaches the rangy striker before he makes a move to foil the goal. Suva has been picking its moments well in the game and some superb goal keeping by Waitakere United stopper has kept the Blues in the game. Minutes later Valerio Nawatu dives in for a header that could have been a goal but all to no avail as it misses by miles. Suva is fast on its counter attack and Solomon Islands import Joshua Tuasolia has been combining well to keep Robinson busy on the other end of the field with some diving saves. 30th Min Update: The physical encounter takes its toll as Inosi Cava is floored by some rugged defensive play by the Blues. The game starts to slow down as Imdad Ali barks orders from the sidelines and the Blues are starting to play more constructively. Suva, sensing that the hosts are starting to change their attacking ploy are starting to scramble for defence, buying time as the match boils down to a scoreless first half. 40th Min Update Suva restarts as Lautoka has made changes to their team with Abu Zahid coming in for Arvindra Naidu to bolster their varying game. Suva loses possession soon after the restart and Lautoka with the likes of Nawatu, Vakatalesau and Alvin Avinesh start to probe using a lot more high balls in their game. Suva has also been employing variations to their attacking with Mishra featuring a lot on the left flank as Inosi Cava, Vetaukula and Datt provide with some superb go-forward balls with their slick passing. This unsettles the Lautoka defence and time and again Robinson is forced to come forward and defen his goal line showing excellent vision and reading the game well. Nawatu is put into a hole after a counterattack launched from the right flank but puts the ball wide as Suva keeper looks well beaten, much to the disappointement of the Lautoka fans on the stands. 50th Min Update: Lautoka coach Imdad Ali has introduced New Zealand based Jurteet Singh who has come in to replace Nawatu while Suva's Maciu Tuilau has come in for Solomon Islands import Joshua Tuasolia. The game has lived up to expecatations and is proving to be a physical one. Midway through the second half referee Behari has yellow carded Suva's Rao for dangerous play. The last quarter of the game sees Lautoka hot on attack, fiercely probing in the Suva half, until Samuela Kautoga collected a loose ball in the Suva box and beat Navitikula to break the deadlock. 60th Min Update: Kamal Hassan comes in for Osea Vakatalesau and the Blues have now come alive with the 1-0 lead and the vocal backing of the home crowd. Suva sensing that they are now running out of time are starting to launch nuemrous attacks on the Lautoka goal but good defending buy the host sees the score reamain. Behari flashes a yellow card at Robinson for wasting time and teh game quickly gets back into motion. 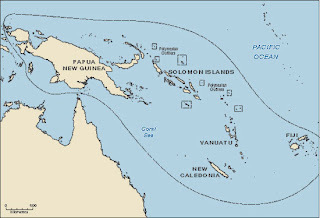 Lautoka: Danny Robinson, Marika Madigi, Samuela Kautoga, Leone Vurukania, Lorima Dau, Salesh Kumar, Osea Vakatalesau, Valerio Nawatu, Alvin Avinesh, Arvindra Naidu, Semesa Nakosia. Suva: Mesake Navitikula, Krishna Sami, Anish Kumar, Sandeep Nair, Joshua Tuasolia, Shamil Rao, Inosi Cava, Lisala Vetaukula, Joseph Mishra, Cedrick Datt, Luke Haaterea. rugby-mad Kiwis enjoy the 2010 football world cup. featured kick-off times in New Zealand. "There was one I found, on a newspaper site, but it was a bit boring," he says. who are less familiar with the Beautiful Game. including the All White's kick off times." ("cheats") and England ("long-ball merchants"). are renowned for our sense of humour... we need one after all!" Seamus Marten, Head of OFC Competitions for the past four years, will leave Oceania's football governing body at the end of May. The 28-year-old has been with the organisation since 2005, originally employed as Media Officer before moving into the competitions department where he has been instrumental in setting up a structured calendar of events including the hugely successful OFC Champions League concept – the O-League. Also during his time he has overseen the implementation of regular Beach Soccer and Futsal championships and developed the centralisation concept aimed at increasing participation at OFC competitions. Marten leaves OFC on good terms and with the support of General Secretary Tai Nicholas who is wishing him well for the future. "We regret that Seamus has decided to move on but understand that he feels this is the right time to do so," said Nicholas. "He has given everything to this job and has been somewhat of an oracle for OFC with his vast knowledge of football and profound understanding of Pacific culture. On behalf of the entire Oceania football family I would like to thank Seamus for his passionate service to the game and we wish him all the best for the future." Marten enjoyed many accolades during his time at OFC including an appointment as Media Officer at the 2006 FIFA World Cup™ and as an Assistant General Coordinator at the FIFA U-20 World Cup Canada in 2007. He has also served on the FIFA Stadiums and Security Committee since 2007. But he says the most rewarding aspect of the job has been working within the unique and diverse Oceania region and contributing to the growth of the Confederation on and off the football pitch. "New Zealand continue to lead our Confederation on the football field, but I have also been lucky enough to witness the qualification of our Pacific Islands countries to various World Cups starting with the Solomon Islands in Beach Soccer and Futsal, and Tahiti at the U-20's and finally with Hekari United FC at club level this year." In a similar vein I have been moved and inspired by the many social responsibility initiatives off the football field, such as the recent Pacific Youth and Sports Conference." It has been a difficult decision to leave OFC but I feel ready to move on and explore other opportunities. I leave OFC with deep respect, admiration and gratitude to the OFC President, Executive Committee, General Secretary and staff as well as the entire football family of the region for whom it was a pleasure to serve." Marten will finish at OFC on Friday 28 May. David Firisua has been appointed to the role of Head of Competitions since 3 May 2010 while an additional recruit will join the competitions department in July. Wellington, May 25 NZPA - New Zealand Football (NZF) has lent its support to Australia's bid to host the soccer World Cup in either 2018 or 2022. The day after losing a friendly 1-2 to Australia, the All Whites unveiled a banner in Melbourne today with the words 'FIFA, pass us the ball and Come Play!'. NZF chairman Frank van Hattum said an Australian-hosted World Cup would be a unique opportunity for New Zealand sporting fans. "World Cup participation has done wonders for the game in Australia and the signs are it could have a similar effect in New Zealand, but having the world's biggest sporting event in our neighbourhood would take the game to new heights on both sides of the Tasman," van Hattum said. He said the close ties Football Federation Australia had maintained with both NZF and the Oceania Football Confederation, meant New Zealand was a natural ally. Vince Grella's two-footed tackled marred the Socceroos 2-1 win over New Zealand, and captain Lucas Neill is concerned the team's aggressive style could be costly at the World Cup. Any similar indiscretion will damage the Socceroos heavily in next month's World Cup finals in South Africa. "It's a lesson for us," conceded Socceroos captain Lucas Neill. "Our passion and commitment is great, but we've got to be very careful because we might find ourselves without key players in key periods of a game and for the rest of the tournament." "We've got to make sure we are fully disciplined going into the World Cup." Grella admitted he went in "a little bit too hard" after New Zealand took a deserved 1-0 lead in Monday night's World Cup farewell match at the MCG. "It was probably not needed in a friendly game," he said. "But it's part of football and I take full responsibility for what happened." Bertos must have thought he was being targeted because within four minutes he was hit by another shocking tackle from Tim Cahill - late and studs-up like Grella's though this time one-footed. The All White was sent flying in the air and had to be stretchered off. Fortunately he sustained no lasting damage, but his World Cup could have ended right there. "It probably could have, but at this stage it's not," a relieved Bertos said later. "I'm pretty thankful.I didn't rate shin pads at the start of my football career, but after that thank God I am wearing them." Bertos did his best to be diplomatic about the crude challenges. "I couldn't really tell what happened, to be honest," he said. "I was just going for the ball in both of them and felt some contact on my leg. The boys are telling me they were strong challenges but I don't know what to say, man." Socceroo coach Pim Verbeek felt no need to tiptoe around the issue, and castigated his players for their recklessness. "I'm going to tell them it's unacceptable," Verbeek said. "You cannot afford to go into any game and make tackles like that. In the World Cup, it's probably two red cards. I can only give compliments to New Zealand that they behaved themselves." "They were very professional. My players were not." Verbeek considered taking Grella and Cahill off immediately but decided instead to substitute them at half time. New Zealand captain Ryan Nelsen revealed the American referee said the Grella tackle probably deserved a red card but "because it was a friendly he didn't give it". Nelsen regularly sees the best and worst of his combative teammate at Blackburn in the English Premier League. "I see Vince do those tackles week in and week out, so I'm not really surprised," he said. An injury-time heartbreaker from Brett Holman fired Australia to a 2-1 win over New Zealand, denying the All Whites what would have been a deserved result against the world number 20 in Melbourne on Monday night. In front of 55,659 fans, the All Whites threatened to gatecrash the Socceroos' farewell party when Chris Killen fired the visitors into a deserved 1-0 lead in the 16th minute after Shane Smeltz flicked on a deep Simon Elliot cross. Only the post denied Killen a second eight minutes later and with Tim Brown shooting just past the post in the early exchanges, New Zealand were well worth their lead. "I think at halftime we could've come in two or three nil up which would've made things a little easier but I'm quite pleased overall with a very solid performance," said All Whites coach Ricki Herbert. "Tonight was a good positive statement on where we are and what we're about." The match was marred by two sickening challenges on Leo Bertos, the first a two footed lunged by Aussie hard man Vince Grella and the second a late clip by Tim Cahill just minutes later that sent Bertos flying and resulted in the winger being stretchered off the field. Neither challenge earned more than a yellow card, although All Whites coach Ricki Herbert was certain they warranted sterner punishment. "I'm a bit disappointed with both tackles and in a normal game we would have been up against nine men." Tim Brown also came in for rough treatment and did not return to the field after halftime but instead travelled to hospital for scans on a shoulder injury. Mark Paston was kept busy collecting or clearing crosses into his area but it wasn't until the 57th minute that Australia broke through the All Whites defences and then only after a tackle from Killen ricocheted the ball into the path of an obliging Dario Vidosic. Tommy Smith, employed as a left wingback amongst a raft of second half substitutions from both sides) picked out Rory Fallon in the 70th minute but goalkeeper Brad Jones was equal to the striker's powerful header. Among the heavy traffic coming from the substitutes' benches was Winston Reid, making his New Zealand debut earlier than expected as a replacement for the injured Bertos after half an hour. The former Denmark age-group international was kept busy in a variety of positions as some pre-planned changes and another injury, this time to Ivan Vicelich, meant Herbert had to keep shuffling his deck. The All Whites depart for Austria on Tuesday evening after a recovery session at their Melbourne hotel. Further World Cup warm-ups against Serbia and Slovenia await the team in Europe with a training match against Chile in South Africa putting the final touches on preparation for an opening FIFA World Cup match against Slovakia on June 15th. New Zealand: 1-Mark PASTON (GK), 2-Ben SIGMUND, 3-Tony LOCHHEAD (19-Tommy SMITH 59), 5-Ivan VICELEICH (18-Andrew BOYENS 51), 19, 6-Ryan NELSEN (captain), 7 Simon ELLIOTT, 8-Tim BROWN (15-Michael MCGLINCHEY 46), 9-Shane SMELTZ (22-Jeremy BROCKIE 67), 10-Chris KILLEN (20-Chris WOOD 67), 11-Leo BERTOS (4-Winston REID 33), 14-Rory FALLON. Substitutes not used: 12-Glen MOSS (RGK), 13-Andy BARRON, 16-Aaron CLAPHAM, 17-David MULLIGAN, 21-Jeremy CHRISTIE, 23-James BANNATYNE (RGK). Australia: 1-Adam FEDERICI (GK/18-Brad JONES 46), 2 Lucas NEILL (captain), 3-Craig MOORE, 4-Tim CAHILL (14-Brett HOLMAN 46), 5-Jason CULINA, 10-Dario VIDOSIC (22-Tom OAR 79), 13-Vincenzo GRELLO (16-Carl VALERI 46), 17- Scott MACDONALD (11-Nikita RUKAVYTSYA 71), 20-Mark MILLIGAN, 23-Mark BRESCIANO (7-Mile JEDINAK 46). Substitutes not used: 6-Michael BEAUCHAMP, 8-James HOLLAND, 15-Shane LOWRY, 19-Nick CARLE, 24-Eugene GALEKOVIC. 5-time SPG Gold Medalist and current 'STOP HIV' Champion, Ms Anolyn Lulu participated in an awareness session on STOP HIV and Anti-Doping with the pre-selection of the Womens National Football Team who are preparing for a tournament in New Zealand in September. About 25 girls gathered at the Antoine Rossie Field for the session. Ms Lulu spoke briefly on Play True letting everyone know that there are substances that are banned from athletes. I also mention about marijuana as an illegal drugs. She explained what STOP HIV is and what we are doing and briefly about what is Sport and HIV. The 5-time SPG Gold Medalist also explained what is HIV, what it does to the body, how many body parts the virus passes through and also explain ABC. She also shared with them the importance and playing safe and to be good role models. In conclusion, Anolyn shared her story and was appreciacive of their responses. A big thank you to the Port Vila Women's Soccer President for seeing the importance of such awareness especially on HIV prevention through sport. Academy F.C. started their NSL matches with a loss to Spirit 08 but then manage to put themselves together and held all their NSL matches against Tafea, Amicale, Tupuji and Spirit, to draws. This afternoon, they played their first 2nd leg match and were defeated by 3 goals to 0 by superb hat-tricks from Amicale's own rocket, Fenedy Masauvakalo. Amicale played well today with great performances from their experienced players having missed to convert easy goals and set a hard lock for the Academy to get through their defense but easily managed to cruise past the Academy's side to back their goals in. What was expected of Academy turned out dull because they had no winning chances and it was Amicale in ball possession the full 90-minutes pressurizing the Academy defense that saw a young elite defender, Brian Kaltak was red card'ed after 2nd caution. But Academy was quick to substitute to seal the loop holes and take the game to a final 3-0 with superb ball work and skills on an inclement weather condition. Captain Fenedy Masauvakalo will be praised by his fans and Amicale fanatics for scoring all 3 goals against the young football scholars, and he sent the message out clear that they came to win and not draw again. "I said to my boys, last time we draw against Academy, this time we must not allow them to deride us or be victorious, and the outcome is good", said Fenedy when he was interviewed by Vanuafoot. "I wish to thank God for the victory", he said. Meanwhile, the 2nd match between Tafea F.C. and Spirit 08 was canceled by a decision from the match officials after consultations with the groundsman and PVFA of the poor pitch condition caused by bad weather. In a later message to football fans, PVFA apologized to all and assured those who paid tickets to watch the two Southern Islands club, a free entry for all, for their re-match next week. The Singapore Youth Olympic Games Organising Committee (SYOGOC) and the Fédération Internationale de Football Association (FIFA) today announced the Football team draw results for the first-ever Youth Olympic Games (YOG). The Football competition in the Singapore 2010 Youth Olympic Games (Singapore 2010) will comprise Men and Women events. The six teams per event will be divided into two groups of three for the preliminaries. Each team will play every other team in the group once. Chile (CHI), Equatorial Guinea (GEQ), Papua New Guinea (PNG), Iran (IRI), Trinidad and Tobago (TRI), and Turkey (TUR) will compete in the Women's event. Bolivia (BOL), Montenegro (MNE), Singapore (SIN), Vanuatu (VAN), Zimbabwe (ZIM) and a team from Confederation of North, Central American and Caribbean Association Football (CONCACAF) will compete in the Men's event. In conducting the draw, the Guest of Honour - Mr Kwek Leng Joo, Board Member and Chairman of the Marketing Advisory Committee of SYOGOC, picked out the team names and Mr Lim Kia Tong, Vice President of Football Association of Singapore (FAS) picked out the corresponding team grouping. Mr John Schmacher, Manager of Olympics and Youth Events, FIFA presided over the draw. The ceremony was also witnessed by officials from FIFA, SYOGOC and the participating National Federations. The first match of the Singapore 2010 Football competition will take place on 12 August 2010 at 6pm between the Women's Football teams of Turkey and Iran. Please refer to Annex A for details on the match fixtures. The Football Team Draw determined team groupings and match fixtures for the 12 participating teams in the Singapore 2010 Football competition. (In photo) Team representatives from the participating National Federations take a group photo after the event. Singapore will be hosting the inaugural Youth Olympic Games (YOG) from 14 to 26 August 2010. The Singapore 2010 Youth Olympic Games will receive some 5,000 athletes and officials from the 205 National Olympic Committees (NOCs), along with an estimated 1,200 media representatives, 20,000 local and international volunteers, and more than 370,000 spectators. Young athletes - aged between 14 and 18 years - will compete in 26 sports and take part in a Culture and Education Programme. The Singapore 2010 Youth Olympic Games aims to inspire youth around the world to embrace, embody and express the Olympic values of Excellence, Friendship and Respect. It will create a lasting sports, culture and education legacy for Singapore and youths from around the world, as well as enhance and elevate the sporting culture locally and regionally. Vanuatu U-15 National Team are currently preparing themselves to take part in the first ever Youth Olympic Games that will take place in Singapore in August this year. The team’s head coach, Mr. Etienne Mermer said he is now changing the environment of the training from a normal training pitch to sand, to improve their overall skill & control, as well as build their leg strength. Training on the sand is also good for keepers because of the soft landings, and the greater effort required for movement. “I believe that with this extra training on the beach, the boys can be ready to take part in the tournament in Singapore” said Mermer. OFC has selected Vanuatu U-15 boys and PNG U-15 girls out from it's 11 member countries to represent Oceania in this tournament. Mr. Etienne Mermer and the team’s Assistant Coach, Wilson August, are now in Singapore to participate in the Youth Olympic Games Draw. 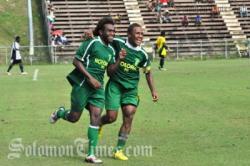 The two coaches will be back in Vanuatu tomorrow night. Players playing in the league are at risk if there are no medics and proper facilities to deal with injuries during a game. 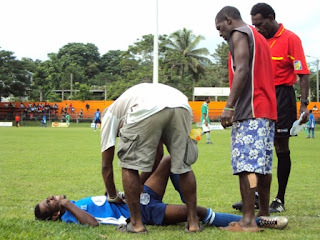 Vanuafoot captured this moment where no medic was available at last week PVFA U-20 matches between Yatel and Pango Green Bird at the PVM Stadium. A Yatel player got injured but took no one's attention and there were no medics available to assist the player who looks to be in terrible pain. It is understood that some clubs provided their own medics but in case of absent medics in an organised PVFA tournament, raises the questions as to who will be responsible if any accident occurs. As we are developing soccer to higher degree of games and competition, some standards needs to be raised and apply not only at international but at every level. Amicale F.C. and Tafea F.C have now 10 points each on the table after Amicale F.C. won Tupuji Imere on Saturday 15th of May at the PVM Stadium. Billy Kidston opened the score 25 minutes in the game followed by a beatiful blast by Rodney from Tupuji 40 minutes later. Batram Suri ended the first half with a winning add-on before Derreck Malas ended the scoreboard with a superb 20-25 metre shot in the centre as Chikau Mansale looks helpless to make a save. Saturday's matches starts the 2nd round of the NSL tournament that saw Tafea leading in the first round now have 10 points equal with Amicale F.C and the red devils could change the story in the 2nd round if they win all their matches. Academy F.C. again draws with Spirit 08 yesterday at the PVM Stadium after previous draws with Top guns in the NSL series - Amicale F.C., Tafea F.C. and Tupuji Imere. The young guns went down to Spirit 08 by 3 goals to 1 in the opening of the series, but manage to put themselves back together and now proving unbeatable to NSL viewers and fans when they are holding their opponents to draw. Moken Maltungtung open the score for Academy 21-minutes in the game, but a penalty before the end of first half saw Robert Tasso equilizes the score and that remained unchanged to end of full 90 minutes. When interviewed by Vanuafoot, Spirit 08 captain, Tari said he was ok about the draw but they could do better if the pitch was 100% dry and that was a driving factor to their mistakes on the pitch. 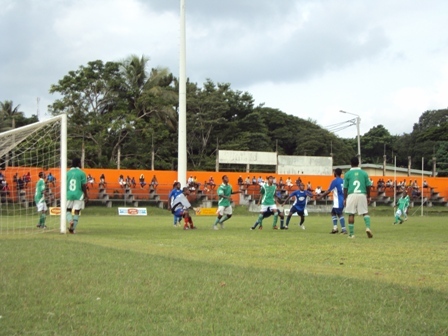 Spirit 08, led by former Vanuatu coach, Carlos Buzetti from Uruguay and former national reps, Noel Vari and Russell Nari, have missed a lot of good opportunities which could have led to an easy victory, but the mistakes and failures are part of the game. However, Academy captain, Leyley said he is happy about the draw and the mistake leading to the penalty could have been avoided, but they are happy over their performance that aims to prepare them for the Oceania U-20 championship in New Zealand in 2011. Both teams are playing the 2nd Round of the NSL tournament and Tafea is leading the table with 10 points followed by Amicale that have now gained points after beating Tupuji Imere in yesterday's 2nd match. Labels: Academy F.C., Spirit 08 F.C. Following their draw against Rewa over the weekend, Lautoka has filed a protest against the Delta Tigers for fielding a player with a wrong license number. Rewa had fielded Nigerian Nuraini Onisemo Akanu in the much tensed match which handed the Blues their first tie of the National Football League. 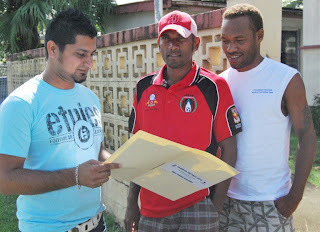 In the protest, Lautoka is alleging the player played under an incorrect license number since his license number in the National League registration form conflicted against the number stated in the team slip for the match. The Fiji Sun/Weet-Bix NFL leaders are also claiming that Akanu does not have proper clearance to feature in the domestic competition. Fiji FA is expected to hear the protest in its next board of control meeting. Labels: Lautoka F.C., Rewa F.C. The Challengers Battle (CB) first leg ended with Shepherds United triumph over Seveners in an interesting match last thursday 13th May, at the PVM Stadium. The afternoon saw a shepherds backed fans back in the PVM Stadium again after missing in the premiere for some time, with beautiful costumes and black and white flag waving around the stadium. It was an interesting game played between the Seveners who have trained hard and camped out for the challenge against the mighty tall shefarian's. The Shepherds team might have capitalized on their heights and the fact that they are the only club in the PVFA with very tall players plus their football skills placed them unique and are favorites too. The match was predicted by fans to be an easy win for the United but after a 1-1 first half, coach Albert Manaroto, Wilson August and Wilkins Lauru quickly identified their weaknesses and sent them back in with new strategies and wining faith and the boys did it. Willie August scored twice to create victory for Shepherds United F.C. over Seveners F.C. with 2 goals to 1. However, the two teams will meet again tomorrow to complete their opening CB match posponed due a cyclone earlier this year. The PVFA U-20 kicked-off this month and last Thursday saw Pango GB U-20 took Yatel U-20 by surprise when they nailed the blues who have a senior team participating in the premiere division by 3 goals to 2. The Green Birds have been absent in the league for quite some time now and the current U-20 could revive the Green spirit again. Former Pango GB star, Steven Kalmet, grand-son blasted 2 goals for the Greens' to take the lead. Pango Green Bird was popular in the early 80's and was PVFA champion in 1983-1984 with great players like Steven Kalmet, Lionel Kaluat and many more. Vanuafoot team is aware that a new football executive was formed in Pango village recently and the win could be the result of these changes. Both teams consisted of very good and potential players if trained well, they could become professional footballers. The afternoon match saw the Green GK displayed some very good keeper skills that stunned a lot of spectators. PVFA U-20 tournament could be an advantage program for clubs to identify and train their players to play professional football and some critics have commented that PVFA should introduce the game to a more earlier age. Chelsea made club history as they defeated Portsmouth 1-0 in an eventful Wembley Cup final to add an FA Cup winners trophy to the Premier League title. The 129th FA Cup Final was an entertaining affair between the Champions Chelsea and bottom of the heap Portsmouth. The Blues narrow victory masked the number of chances they created and could have paid the price for their profligacy had Pompey not missed a penalty. 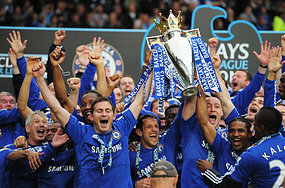 But in the end it is Chelsea who earn the accolade of League and Cup double winners. At the end of the end of a one sided first half the score was 5-1 to Chelsea. Unfortunately for the Premier League Champions this was not goals scored but the number of times they had hit the woodwork compared to Pompey. The tempo for the half was set after only 3 minutes when Frank Lampard fired wide after Nicolas Anelka's initial shot had been blocked. Then the woodwork began to have its influence on proceedings as Portsmouth were pushed back on the defensive. Lampard hit a swerving effort against the frame from 25 yards with David James well beaten. Anelka then brought a fine save out of the keeper before Didier Drogba was twice foiled by Aaron Mokoena blocks. Then totally against the run of play Portsmouth had a marvellous chance go in front as Kevin Prince-Boateng's mishit shot found Frederic Piquionne who from close range could only direct his effort against keeper Petr Cech and onto the frame of goal. After 26 minutes Salomon Kalou made a case for the worst miss in an FA Cup final. Ashley Cole broke into the penalty area and squared the ball for Kalou, who from six yards and with the goal gaping fired against the cross bar. Still Portsmouth defended desperately and again were grateful to the woodwork as John terry was allowed a free header against the cross bar. Drogba then thought he had given the Blues the lead when his free kick was pushed onto the bar by James and the ball bounced down onto the line. The Ivory Coast hit man then hit the outside of the post as the keeper dived at his feet. The second half was no less dramatic as within the first eight minutes Portsmouth missed a penalty and Chelsea took the lead. Chelsea substitute Juliano Belletti made a rash challenge on Aruna Dindane and referee Chris Foy had no hesitation in awarding the spot kick. But Boateng made a poor attempt from twelve yards and Cech, despite diving the wrong way, saved with his legs. Within two minutes the Champions took a deserved lead. Drogba bent a perfect free kick around the Pompey wall, and whilst it hit the post this time it bounced into goal, much to the relief of the Blues supporters. Kalou then dragged a shot wide and Drogba forced a block from James before Portsmouth made a series of substitutions and suddenly began to look threatening. Dindane had a couple of half chances as Chelsea lost some of their swagger but then were handed the perfect opportunity to settle the game with three minutes remaining. Lampard was clearly brought down in the penalty area but the England international picked himself up and incredibly pulled his spot kick wide of the post. But despite a late rally from Portsmouth it was Chelsea who saw the game out. France will go to the World Cup without Karim Benzema after coach Raymond Domenech decided to omit the Real Madrid forward in favour of Toulouse striker Andre-Pierre Gignac and Panathinaikos goal-getter Djibril Cisse when he announced his 30-man squad for South Africa on TF1 on Tuesday evening. Domenech was expected to announce his final 23-man party, but his first surprise was to instead announce a panel of 30 players that will need to be trimmed before the World Cup begins on June 11. While notable figures such as Manchester City's Patrick Vieira, Sevilla's Julien Escude and Arsenal's Samir Nasri failed to make the cut, the typically enigmatic Domenech elected to name a host of wildcard faces in his squad. 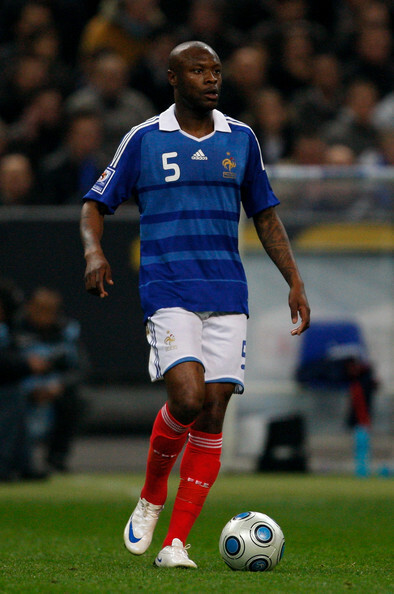 Stade Rennais teenager Yann M'Vila and Olympique de Marseille's Mathieu Valbuena, neither of whom has previously earned international recognition at senior level, were two of the most eyebrow raising inclusions. Valbuena's OM team-mate Hatem Ben Arfa has made the cut, despite finding himself increasingly playing the role of substitute at Stade Velodrome after a bright start to 2010, while Rennes forward Jimmy Briand has been rewarded for a fine conclusion to the campaign by being named in the 30. Notably, 'Dom' has also included four goalkeepers in the squad, meaning that one, probable either Cedric Carrasso of Girondins de Bordeaux or the recalled Mickael Landreau of Lille, will be axed from the team that will travel to South Africa. Brazil coach Carlos Dunga has announced his 23-man squad for the World Cup finals in South Africa this summer. As was widely anticipated in the weeks building up to the announcement, there is no place for AC Milan star Ronaldinho. Dunga has also omitted Flamengo striker Adriano and Corinthians pair Ronaldo and Roberto Carlos, all of whom had faint hopes of making the squad. Two of Brazil's rising stars in Alexandre Pato and Neymar are also staying at home. The core of the team from the qualifying campaign remains though, while there are also call-ups for Tottenham Hotspur 'keeper Heurelho Gomes, Cruzeiro veteran Gilberto and, perhaps most surprisingly, Wolfsburg striker Grafite. Neither Carragher nor King has played a game for the Three Lions under Capello, although the Tottenham man was called into the squad for a double header against Slovakia and the Ukraine last year, only to be ditched a couple of days later on fitness grounds. However, with Gareth Barry selected, despite on-going concerns over the ankle injury he suffered during Manchester City's defeat to Tottenham last week, Capello has decided not to call on Owen Hargreaves, as had been predicted even though the midfielder has played only one minute of senior football since October 2008. Only three goalkeepers - David James, Robert Green and Joe Hart - have been named, whilst attempts to talk Wayne Bridge out of making himself unavailable have been less successful than Capello's efforts with Carragher. Amongst the players who were mentioned as candidates but did not receive a call were Gary Neville, who was an outside bet anyway, Stewart Downing and Carlton Cole. In addition, Bobby Zamora has failed to secure a place amongst the final 30 despite his outstanding contribution to Fulham's excellent season. Aston Villa boss Martin O'Neill will be disappointed there are no spots for Downing, Gabriel Agbonlahor or Ashley Young, even if Stephen Warnock will travel along with James Milner. Missing out on today's squad does not necessarily end all hope of reaching the World Cup. The young footballers aka Academy F.C. 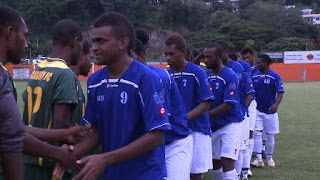 have proved again to football fans and keen NSL viewers that they are hard to beat when they held the mighty Tafea F.C. to a 1-1 draw last weekend, 8th May 2010. Last Saturday's match between the young footballers and Tafea F.C. saw an Academy team dominating the full 90 minutes, however both teams have missed some very good opportunities. It was a header from Jean Kaltak in the 63rd minutes that sent the Academy team and fans off their feet and 6 minutes before the end of game, Sakama and Jean Nako responded with an easy goal diverted by Nako. The young footballers put on a superb game against their 3 coaches - Moise Poida, Richard Iwai and Etienne Mermer, displaying some very good body contact and 1-2 passing skills stunning their fans and the afternoon spectators. The other match saw Spirit 08 wiping out Tupuji Imere by 4 goals from Maureen Bob, Nick Iau, Davidson Tari and Robert Tasso. 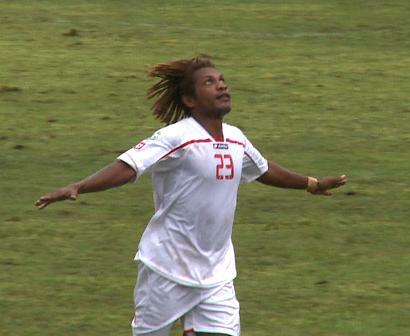 VFF announced 42-men pre-squad for Melanesian Cup. 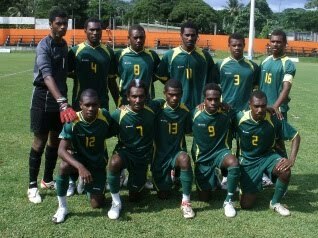 The Vanuatu Football Federation has announced a 42-men pre-squad to take part in the Melanesian Cup which will be hosted by Vanuatu in Port Vila on 31st of July to 7th of August 2010. The players are Ernest Bong (Amical), Chikau Mansale (Tupuji), Alfred Malas (Tafea), Seloni (Academy), Ham (Spirit 08) and Kalnase Charley (Shepherds) as goal keepers. Defenders comprised of Bulega Paul (Amical), Aru Stewart (Amical), Tari Selwyn (Amical), Bula Chilia (Tupuji), Freddy Vava (Tafea), Jeffery Gete (Tafea), Robert Thomas (Tafea), Samson Obed (Tafea), Joe Roger (Tafea), Leyley Hinge (Academy), Brian Kaltak (Academy), Andrew Chichirua (Ifira), Rexly Tari (Spirit 08) and Philiame Nikiao (Spirit 08). Midfielders consist of Yelou Robert (Amical), Derick Malas (Amical), Richard Garae (Amical), Moise Poida (Tafea), Francois Sakama (Tafea), Richard Iwai (Tafea), Johnny Tirang (Academy), Rody Lenga (Spirit 08), Spensen (Seveners), Noal Maurice (Siwi), Lorry Thomsen (Shepherds), Antony Malapa (Tupuji) and Nemani Roqara (Academy). 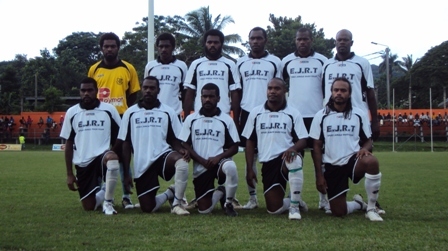 Strikers include Fenedy Masauvakalo (Amical), Bula Kalsopa (Tupuji), Jean Nako (Tafea), Jonah Ian (Tafea), Jean Kaltak (Academy), Walter Chichirua (Ifira), Jeffery Tess (Westtan), Robert Tasso (Spirit 08) and Daniel Michel (Shepherds). The pre-squad training started off on Monday 10th May at the PVM stadium and will continue every Monday and Thursday. New Zealand's locally based All Whites signed off their 10 day New Zealand camp with a 2-0 win over an NZFC All Stars team at North Harbour Stadium this afternoon. AUCKLAND - New Zealand's locally based All Whites signed off their 10 day New Zealand camp with a 2-0 win over an NZFC All Stars team at North Harbour Stadium this afternoon. Playing in their all black strip the New Zealand A team dominated throughout the match but had to wait until the 34th minute to eventually break the deadlock. A long ball forward was expertly controlled by Costa Barbarouses who laid his pass back to Shane Smeltz. Smeltz's effort on goal was parried away by Jacob Spoonley allowing Jeremy Brockie the easiest of tap- ins. Leo Bertos and James Pritchett replaced Brockie and Aaron Scott at halftime for New Zealand A, while Glen Moss got a run in goal for the All Stars. Moss had to be alert early in the second spell as he got a finger tip to a shot from Ivan Vicelich to turn the ball away from goal. Barbarouses and Smeltz were a constant threat for the All Stars, while David Mulligan, playing in a defensive midfield role, had a busy game. It was Barbarouses that added to the score in the 73rd minute. A long cross field ball was turned back into the penalty area by Aaron Clapham and Barbarouses was on hand to tap into an empty net. The All Whites will disband and come back together on May 19 to prepare for the match with the Socceroos at the MCG in Melbourne on May 24. They then head off to a pre World Cup camp in Austria. The 23 man All Whites squad for the FIFA World Cup in South Africa will be announced at 1pm tomorrow (Monday May 10). 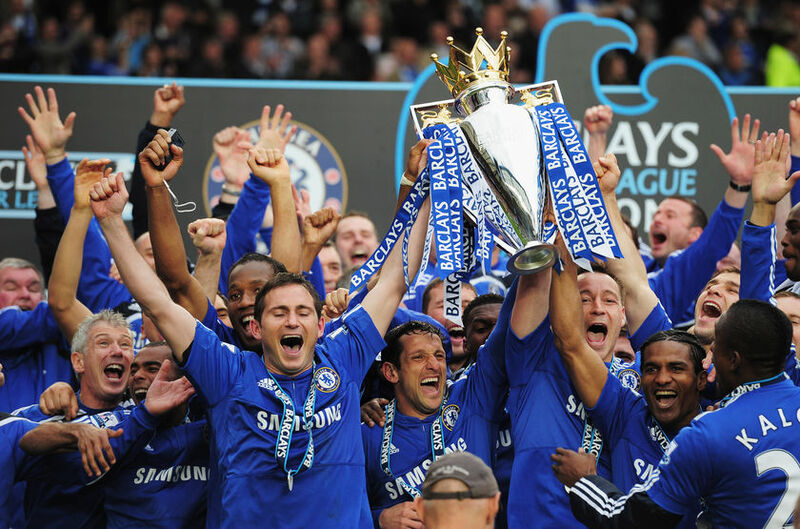 Lampard hoist the Premier League trophy high. Chelsea has been crowned English champion after thrashing Wigan 8-0 in an emphatic finale to a season in which it pipped Manchester United by a single point and banged in a Premier League record 103 goals. As well as denying United what would have been an unprecedented fourth consecutive title, Chelsea's biggest ever top flight victory ensured Carlo Ancelotti's first season in charge ends with the league trophy back in west London for the first time since Jose Mourinho masterminded back-to-back triumphs in 2004-05 and 2005-06. "It's fantastic, we did our best and I did my best for this club," the delighted Italian said after delivering the title that had proved elusive for his predecessors Avram Grant, Luiz Felipe Scolari and Guus Hiddink. "It's been a great Premier League season and I think in the end we deserved to come out on top." United did its job by beating Stoke 4-0 at Old Trafford but there was never any prospect of Chelsea falling at the final hurdle. Ancelotti's men will now seek to complete a domestic double in the FA Cup final against Portsmouth on Saturday and the Italian believes his current squad can remain top dogs in English football for years to come. "I think that this club will have a future because these players are not so old and we have a very good squad, for next year and the years after," he said. "We had a fantastic season, not only by winning the Premier League but because we showed a good style on the pitch," Ancelotti said. "After the first year, I hope to stay here a long time and win a lot of titles." Against injury-depleted opponents, it took Nicolas Anelka only five minutes to calm the Chelsea supporters' nerves with the opener and any doubt over the destiny of the trophy disappeared just after the half hour mark when Gary Caldwell wrestled Frank Lampard to the ground inside the box. The Scotland defender was given his marching orders and Lampard got up to fire in a textbook penalty for his 22nd league goal of the season. "When we heard Wigan were down to 10 men all our hopes evaporated," acknowledged Ferguson, who felt United, with a little more luck, could easily have claimed a fourth consecutive title. "I am not going to agonise about where it went wrong. "Sometimes you get the breaks, on other occasions you don't. Didier Drogba got involved in an unseemly spat with Lampard over who was taking that penalty but still finished the afternoon with a hat-trick, which ensures he takes the EPL's golden boot with a total of 29 league goals, three more than Wayne Rooney managed for United. Arsenal clinched third place with a 4-0 win over Fulham, ensuring another money-spinning season of Champions League football at the Emirates. The Gunners enter directly at the group stage while Tottenham's fourth place means they must come through a final qualifier to fully benefit from their elevation to a place among Europe's elite. Andrey Arshavin, Robin van Persie and Carlos Vela were on target for Arsenal, which also benefited from an own goal by Chris Baird against an opponent which clearly had one eye on Wednesday's Europa League final against Atletico Madrid. A memorable season for Spurs ended in weary fashion and with manager Harry Redknapp fuming at his side for conceding a two-goal lead to lose 4-2 at Burnley. "We've had a great season, I've been delighted with the performances during the year, but you always want to win," Redknapp said. "I didn't come here just to have a jolly up." A deeply frustrating season for Liverpool ended with a goalless draw at Hull that ensured Rafael Benitez's side could finish no better than seventh in the table. Above them, in fifth place, is Manchester City, which was held to a 1-1 draw at West Ham, and Aston Villa, which held on to sixth place despite a late Richard Dunne own goal resulting in a 1-0 defeat at home to Blackburn. Those results mean Liverpool will have to come through a final qualifier as well as the play-off round to get into the group stages of next season's Europa League. A bevy of strikers and attack-minded midfielders has given a dangerous look to the NZFC All Stars named today to play New Zealand' A' at the end of the All Whites domestic camp this Sunday. AUCKLAND – A bevy of strikers and attack-minded midfielders has given a dangerous look to the NZFC All Stars named today to play New Zealand' A' at the end of the All Whites domestic camp this Sunday. Co-coaches Paul Posa and Neil Emblen have named four out-and-out strikers including YoungHeart Manawatu's golden boot winner Seule Soromon, former All Whites Brent Fisher from Waitakere United and Team Wellington's one-cap international Greg Draper. Canterbury United striker Russell Kamo ensures the South Island goal scoring stocks are well represented, and there is an attacking edge within the midfield ranks where recent All Whites Chad Coombs, Jason Hayne (both Auckland City) and Allan Pearce (Waitakere) are joined by exciting Canterbury prospect Tom Lancaster and Otago United stalwart Andy Coburn. The match is quickly shaping as the last chance for players on both sides to impress All Whites coach Ricki Herbert as he puts the fills the remaining spaces in his squad of 23 for South Africa. For the All Stars Hayne and Coombes, who may play as a fullback, may be the most likely to force their way in with a strong performance but there are plenty of New Zealand 'A' players, including Aaron Scott and James Pritchett who were drafted into the current All Whites camp, with points to prove. With Ricki Herbert declaring there were "four or five" spots still available for players making a case for inclusion in his World Cup squad, All Stars co-coach Neil Emblen thought Sunday's match was a great way for candidates to make their closing statement. "It's exciting for everybody. It's a great concept and good for both camps," Emblen said. 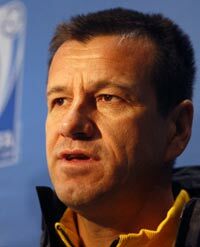 "It says the All Whites squad is not finalised and there's still some spots up for grabs if someone makes a late run." "There's some lads training with the All Whites at the moment and some guys who have been in recent squads but will be with the All Stars. Ricki's casting his eye over everyone and asking them all who wants it most." Goalkeepers Jacob Spoonley and James bannatyne who have both been in camp with the All Whites this week will share the gloves for the All Stars leaving Mark Paston and Glen Moss to do the same for New Zealand 'A'. The All Stars squad also has an eye on the future, with Ian Hogg, Tim Myers and Adam McGeorge all eligible for New Zealand's next 2012 Olympic campaign. 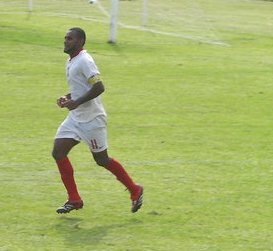 Waitakere duo Benjamin Totori and Roy Krishna were unavailable for selection, returning back to the Solomon Islands and Fiji respectively this week following the conclusion of Waitakere's NZFC and O-League seasons. The match kicks off at 2pm Sunday at North Harbour Stadium. Tickets are available from Ticketmaster. New Zealand 'A' (from): Mark Paston, Glen Moss, Aaron Scott, James Pritchett, Tony Lochhead, Dave Mulligan, Ben Sigmund, Ivan Vicelich, Andy Barron, Leo Bertos, Jeremy Brockie, Tim Brown, Aaron Clapham, Cole Peverley, Costa Barbarouses, Shane Smeltz.